The movie that was scheduled for this morning was to be Curse of the Wolf but I must tell you, I couldn't sit through it. Seriously, it was the next one in the multipack of cult favourites in the horror pack I got the other week, but less then ten minutes into it I had to turn it off. Not even the fact the Blue Meanie stars in it could keep it in the dvd player. It was just so bad. Cheesy even. 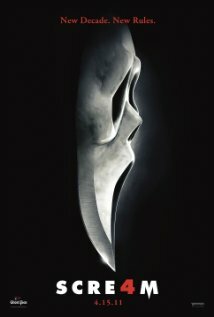 But on the topic of horror films, I got to see Scream 4 few days ago. And I have to wonder why? No, I'm seriously wondering what came over me to rent this film given I hated the other Scream films. It was one of those bored afternoons and it was new I think. Scream 4... well, it only half way sucked. It actually held up slightly better then the others in the series. Plot: it's ten years later and Sydney has returned home for a book signing on the anniversary of the killings. Someone has decided they need to recreate the killings only better. Soon, Sydney finds herself up to her nose in guts and cult cuts as there is a film fest of the "Stab" films based on her life. The body count rises and the last three survivors of the original event are faced with their own remake. This is a Wes Craven film, it should have been a home run but sadly wasn't. If they had just skipped #2 and #3 going straight from the first Scream to this one, that would have been killer.